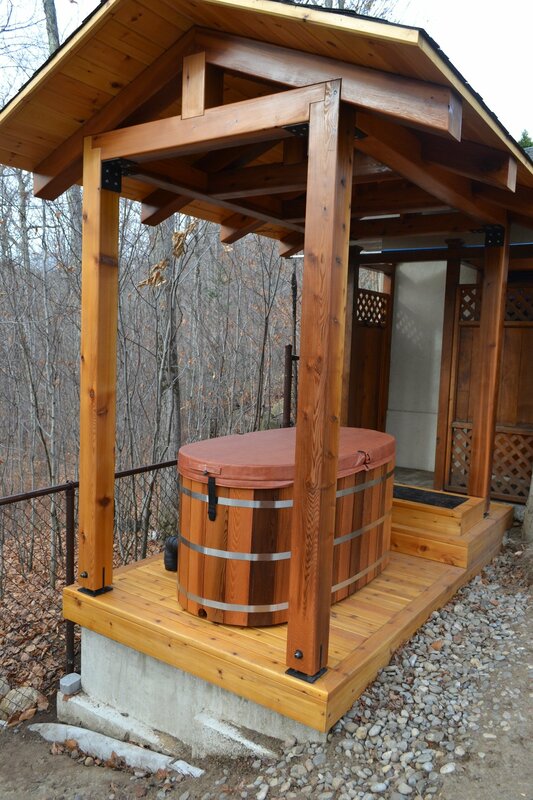 Ofuro Soaking Tubs originate from Japan where bathing is not just a bath but rather a spiritual ritual. 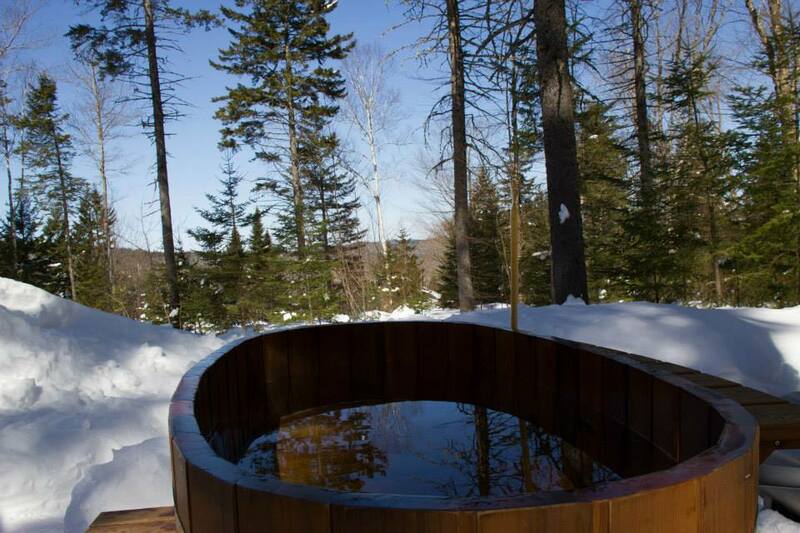 The Ofuro bathing practice differs from North American and European bath tubs, Ofuro bath tubs are 'zen' like providing a sensual pleasure and a feeling of well-being and harmony with the natural surroundings, perhaps in a garden or spiritual landscape. 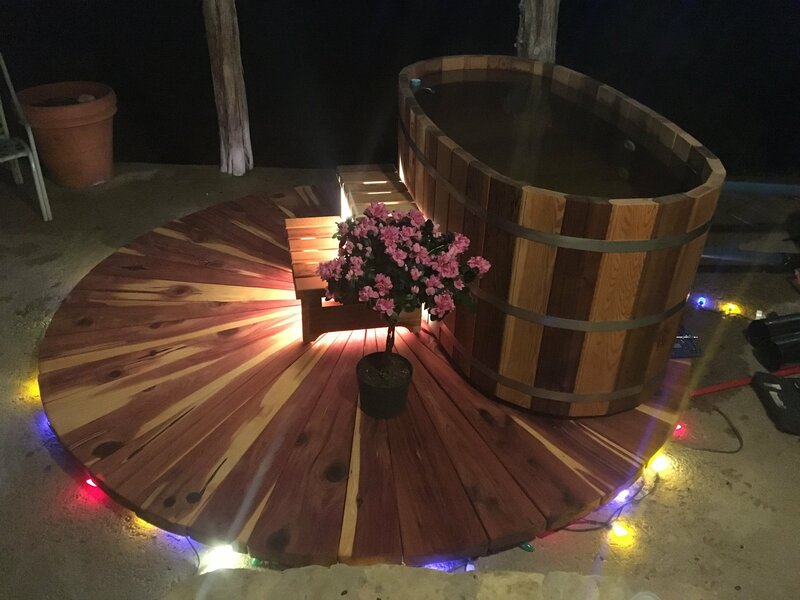 Japanese bath tubs help to restore mental and spiritual well-being by providing a private relaxation space, and they promote good health by stimulating circulation. 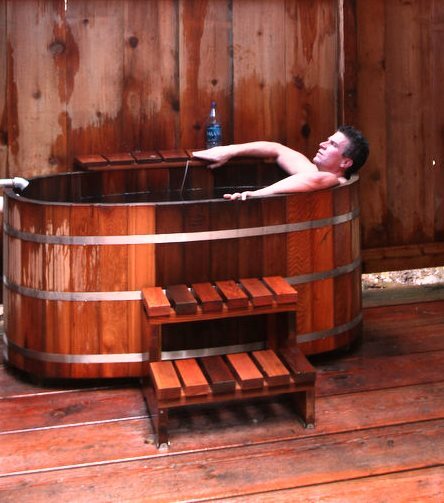 The mechanics of an Ofuro Tub require a deep chin down soak which means the tub is a deeper tub than normal bath tubs. 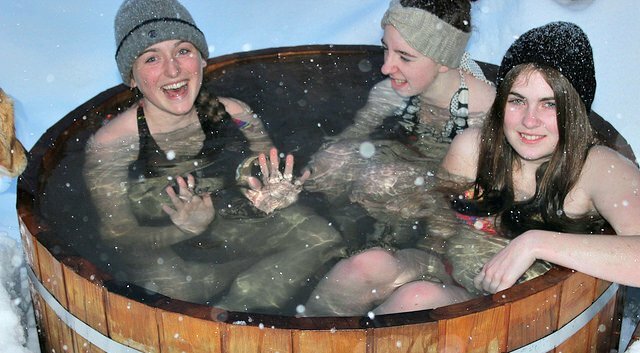 Traditionally Japanese soak in very hot water heated by means of a quiet non-electrical Wood Fired Hot Tub Heaters. 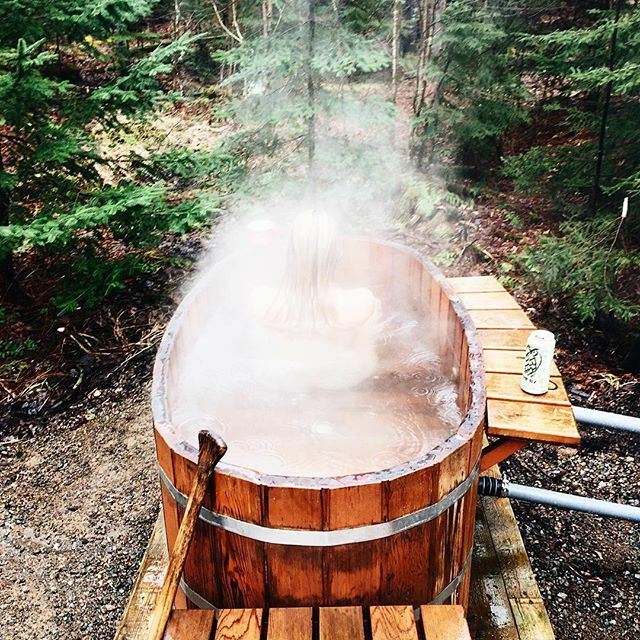 The thick cedar construction of our Ofuro's means that the tub will maintain its heat much longer than a regular tub. 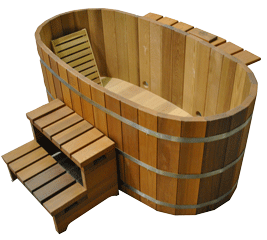 Our 'Fuoro Tubs" are made of clear Western Red Cedar which is a close cousin to the traditional cypress wood used in Japan. Red Cedar has the distinct advantage of being naturally resilient to decay and bacteria. It also is known for its high insulating value. 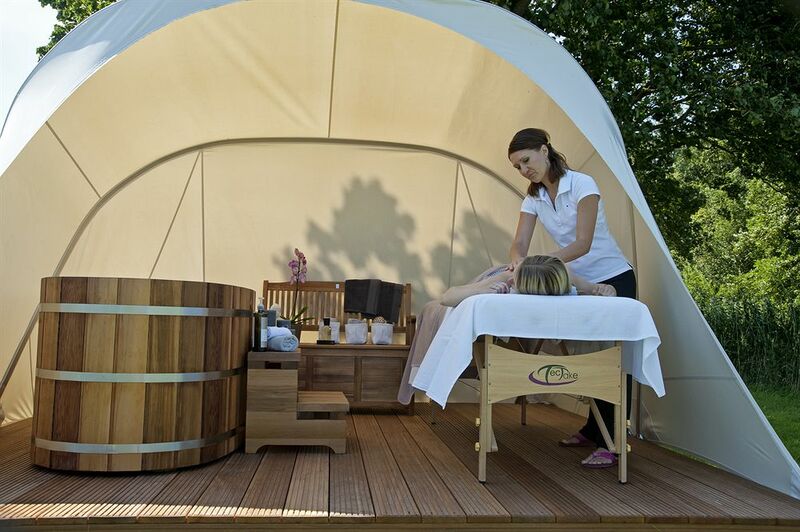 The pleasant aromatherapy of cedar heightens the experience! 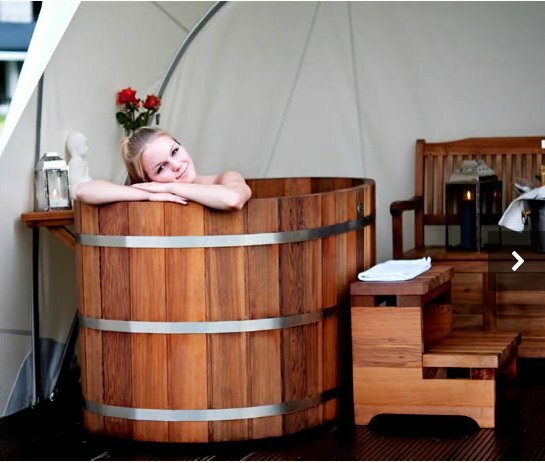 Our tubs use an architectural stainless steel strap system which allows the tub to naturally expand and contract with out worrying about the wood splitting. The Japanese Soaking Tub bath meant much more that just getting oneself clean. After shedding one's clothes and daily concerns, they then lathered, scrubbed and rinsed thoroughly before entering the tub. Once the body was clean, they then stepped into the Tub sinking slowly into the deep, pure and clean hot water. 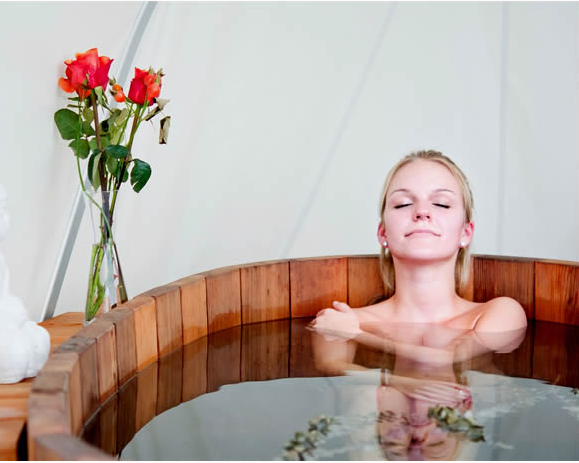 Soaking, submerged to the chin, it is a time for relaxation and contemplation. Soaps and shampoos are not typically used although mineral salts and light fragrant oils are often added. 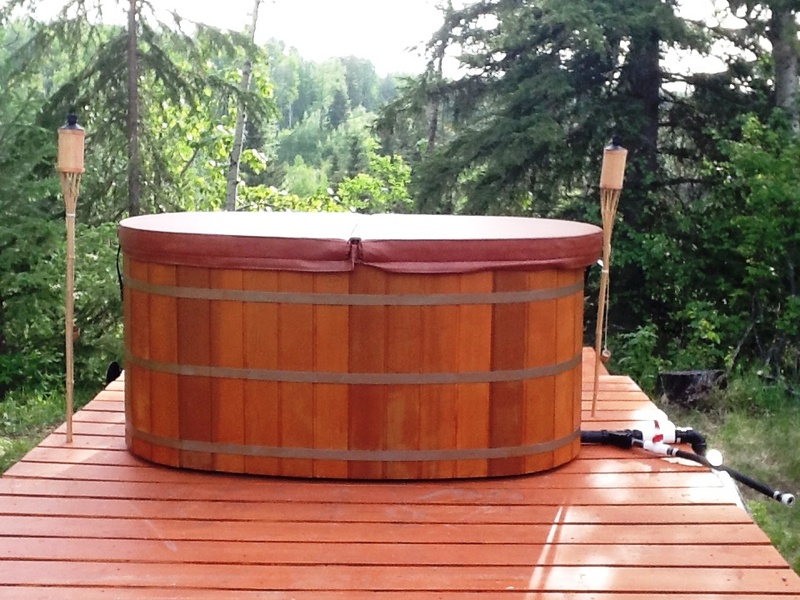 Northern Lights Cedar Tubs manufactures two distinct styles of Ofuros. 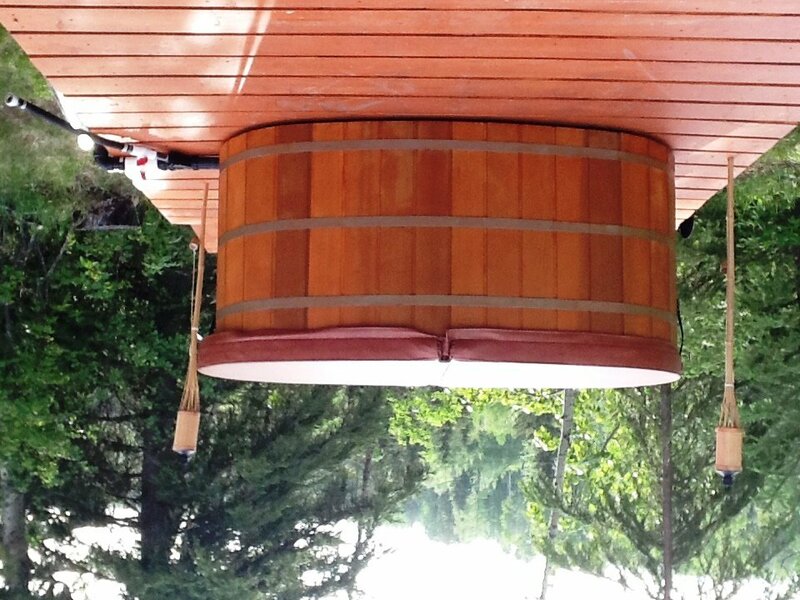 One is oval in shape that is perfect for a two person soaking hot tub, the other is a round round version (50"OD). 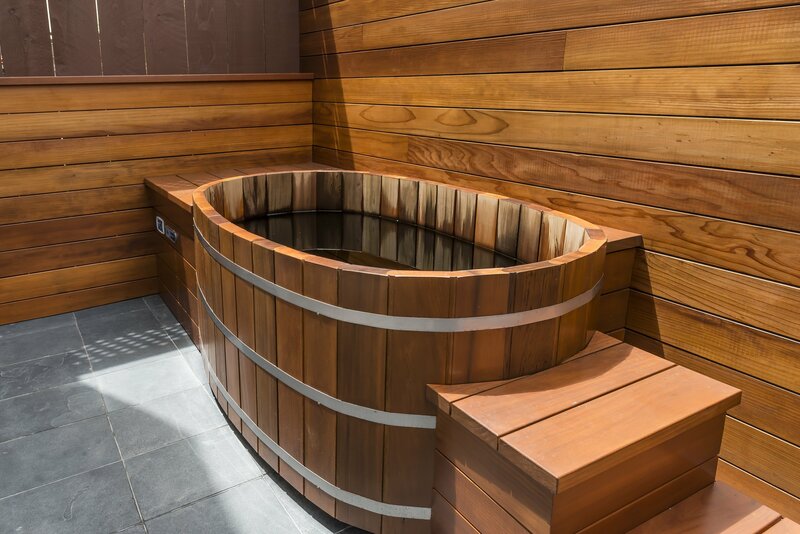 All our Ofuro tubs have 25" of interior height (30" exterior height) which is an ideal depth to provide a full body soak while still being able to enjoy the visual surroundings. Japanese soaking tubs can also be installed indoors. However because there is no liner, we suggest proper tiled floor drains or a shower basin be installed. Most people like their Japanese baths very hot so one should also consider proper ventilation . 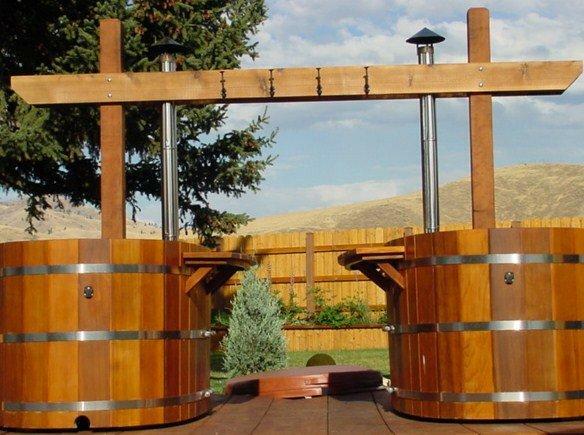 Garden or deck hot tubs settings require very little consideration other than heating method. 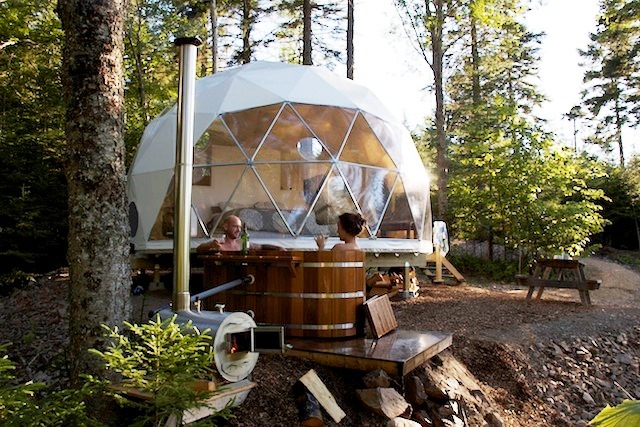 Two main stream heating choices are available including the traditional wood fired heater and our electric hot tub heating system. Ask the sales team if you desire to use a propane heater. The electric hot tub heater comes with a quiet circulating pump, 1.4/5.5kWelectric heater with LCD controller and a 50sq.ft. filter. 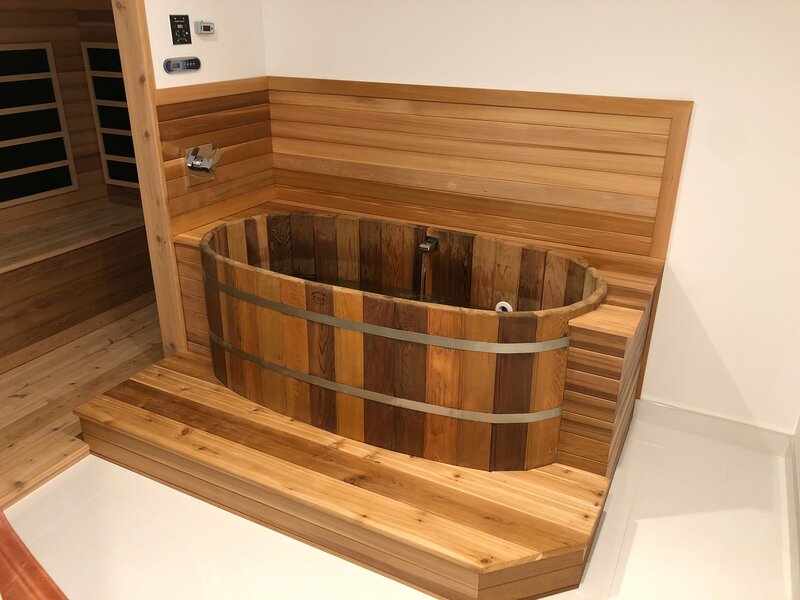 This system can be used for those that want to enjoy more of a traditional spa style usage without the frequent water changes and the tub is usable in the winter without the worry of pipes freezing. 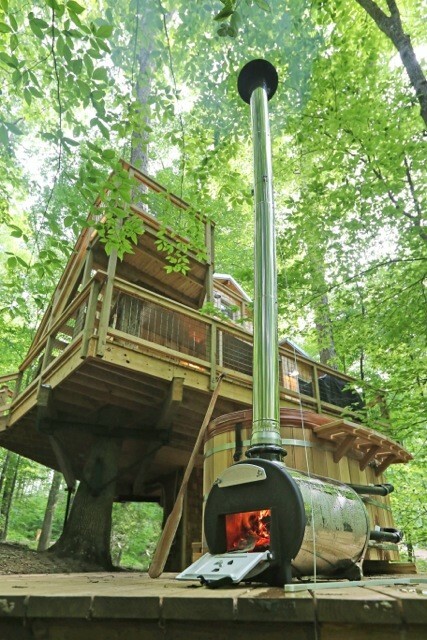 The wood heated option uses our small Timberline wood heater. 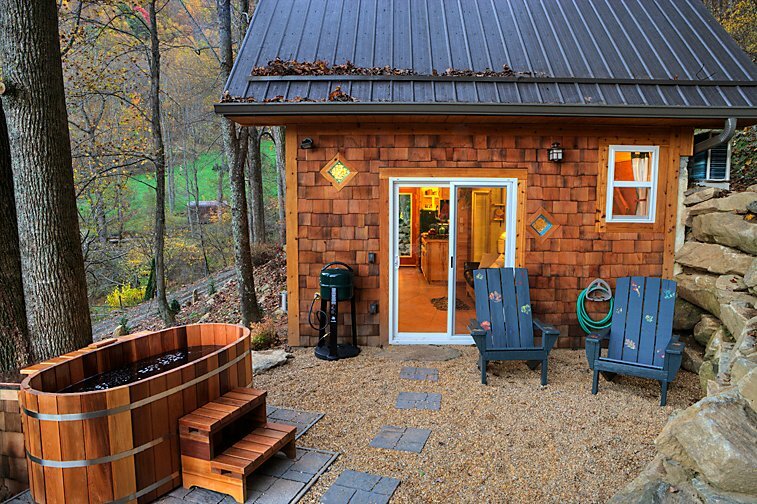 It allows the hot tub to be heated without having electricity available. When the grid power is available this system can further be uprade if desired with various electric heater options. With any of these you then gain the benefit of having the water filtered and keeping the water warm without constant attention to the fire. 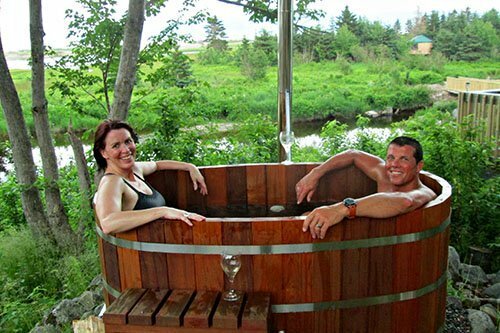 Such an addition is also recommended if the tub will be used in freezing weather. All tubs come fully assembled with a standard center positioned stainless steel drain that connects to any 1 1/2" PVC drain pipe (other positions available on request). Optional accessories include matching stairs, shelf, back rests, and insulated covers with child -proof locks. Our electric heating system comes with a 1.4/5.5 KW Balboa digital spa pack and a 1/8 HP circulating pump & filter. This system allows bathers to control the temperature with the touch of a button. The filter system helps keep the water clean without the need for frequent draining. The kilowatts produced depends on the service voltage, 1.4 kW is produced with 120v service. We can also offer a higher end spa pack that produces 4 kW of heat and has advanced programming options as well as wireless remote control capabilities using an iPhone. Have Lots of free wood? 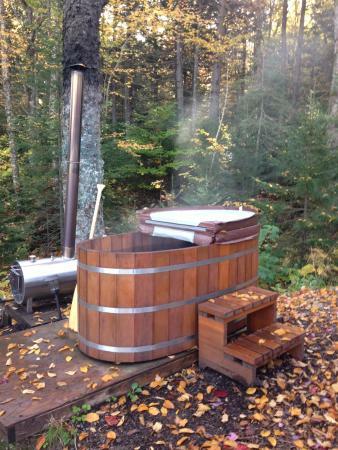 Use our wood fired hot tub heater! 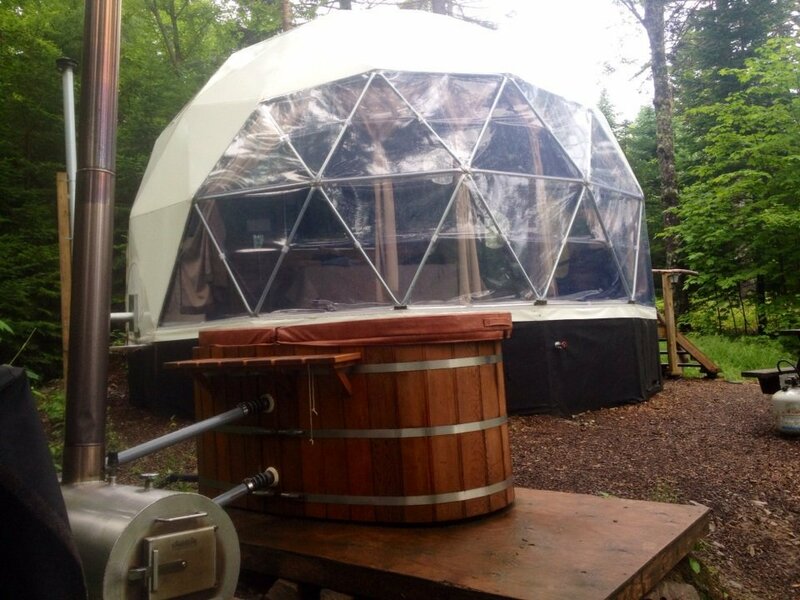 Because of the smaller volume of water these tubs can be heated in about 1-2 hour, with only the cost of wood. No electricity is required, but because there is no filtering water will get murky faster and water will need to changed often. Have lots of free wood and have access to grid power? 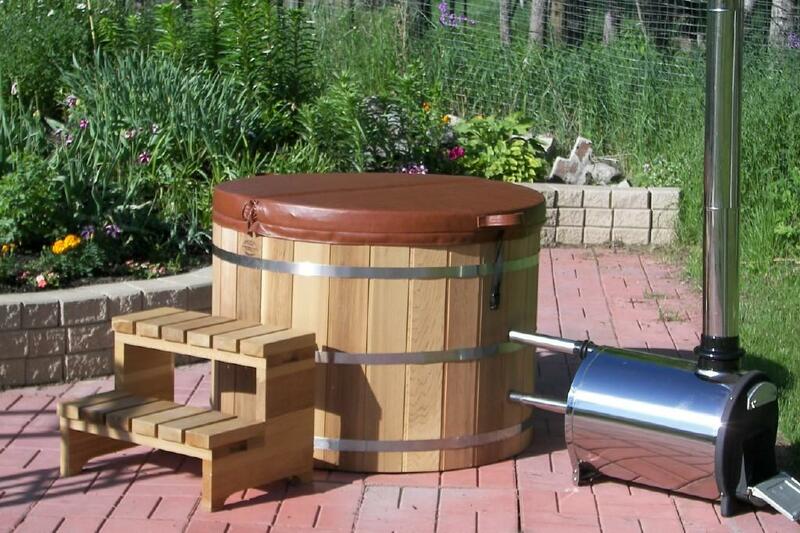 Use our wood fired hot tub heater and augment it with a pump and filter system to keep the water clear! Further consider the addition of an electric heater to the filter system so once you have heated the water with the wood heater you can keep the water at the desired temperature without constantly attending to the fire. The electric heaters vary from a simple inline heater to more sophisticated digital spa packs similar to those mentioned under choice 1. Filter and electric heat options is recommended when used in freezing weather. No grid power available and don't like the work involved with wood? Consider a propane heater with a solar PV powered circulation pump. 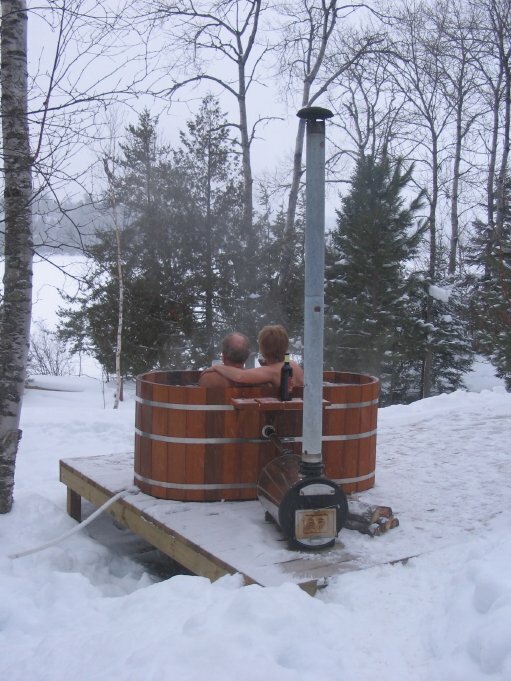 A propane heater requires a circulation pump. We can supply a very efficient pump that is powered off a small inverter, which in turn obtains its power from 24 VDC batteries charged by an 80W PV solar panel. 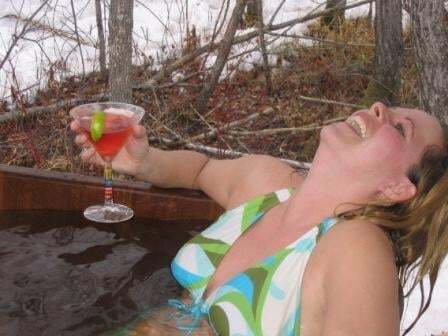 A cold tub is heated in less than an hour.